Be so kind and rock the vote for me! 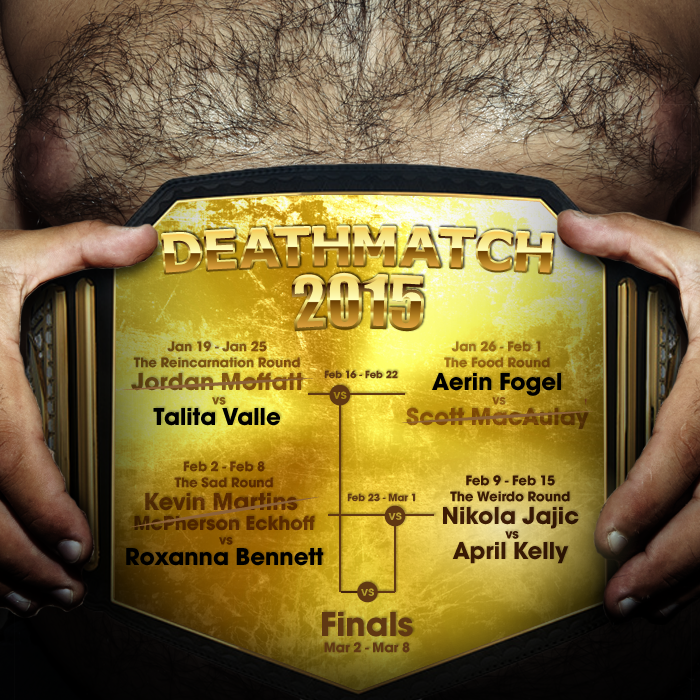 I was lucky enough to have a short story I wrote chosen as one of the 8 finalists for the 2015 Indie Writers’ Deathmatch by Broken Pencil Magazine. For those who don’t know, the Broken Pencil staff have chosen their favorite stories, and now these stories have been pitted against one another (Hence the deathmatch), and are currently being voted on by readers. Step Two: Vote for your favorite (My story please). Vote repeatedly. You can vote once every hour. Step Three: Sound off in the comments. Step Four: Blog, tweet, tell all your friends – help your favorite author win! Step Five: Repeat until an Ultimate Winner is declared and all others lie bleeding in the dust. The literary kumite has begun! Please vote for me. I want this belt!